The idea of a handbook for golfers on the etiquette of the game intrigued me as soon as I heard about it. 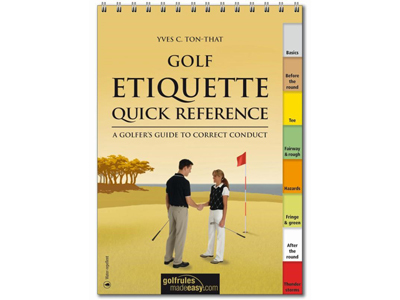 Since it was written by Yves Ton-That and I was familiar with another of his guides, “Golf Rules Quick Reference,” I presumed his new “Golf Etiquette Quick Reference” would be equally well done and it is. It can be considered a handy reference for novices as well as those who have played all their lives and starts with terminology plus a few basics such as why one should have at least a rudimentary idea of the Rules of Golf, even defining the meaning of golf etiquette. Other sections cover almost every situation one will run into on the course from how to and what to do before and after the round plus how to dress and even simpler things like shaking hands with your playing partners on the 18th green. Many will find things they weren’t aware of—how to fix a pitch mark on the green for example—or knew and hadn’t placed the proper importance on, speed of play and being ready when it’s your turn. The “Golf Etiquette Quick Reference” is 48 pages spiral bound and available in golf shops and online at Golf RulesMadeEasy.com for $12.95.